Author: Joseph of Jesus and Mary. Lord Jesus, I come humbly before your Presence. Please cover my body, mind and soul with your Precious Blood and protect me from evil. Hide me from the enemy, hide me from temptation and sin, and hide me from all evil. Keep me safe in Your most Holy Wounds and the fire and light of Your Sacred Heart and the Immaculate Heart of Mary. Don’t let anything evil enter me and don’t let anything evil come out of me. Form a sphere of protection, surround me and seal me with Your Presence, the Presence of the Blessed Virgin Mary, the angels and the saints; so that you will always be in front of me, behind me, at the right, at the left, at the top, at the bottom, outside and inside of me, all around me. Lord Jesus let me live through You, with You, in You and for You. I desire to be always in Your Presence and to walk with You. I ask you to fight all my fights and win all my battles. I consecrate my thoughts, words and actions to your Divine Light. Please help me to see in Your Light what is good and what is bad and grant me in Your Wisdom to choose the best according to Your Holy Will. Please protect me from taking bad decisions. Protect us Lord from natural and man made disasters. Protect us from earthquakes, tsunamis, storms, floods, droughts, landslides; volcanic eruptions, ash, lava and inclement actions of nature. Protect us from war, famine, injustice, persecutions. Protect us from the devil. Protect us from criminals, evil doers, deceivers, thieves. Protect us from black magic, divinations, envy, jealousy, hatred and all capital sins. 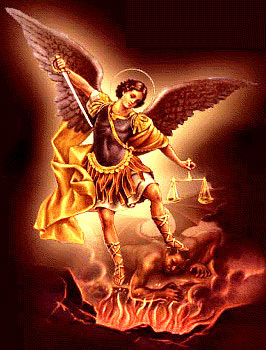 Protect us from the temptations of the world, the devil and the flesh. Protect us from wild and poisonous animals, from mosquito bites. Protect us from pest and disease, sickness, pain and death. Protect us from poverty, calamity and ruin. Protect our integrity, our dignity, our faith, hope and love. Protect everything that we are and everything that we have. Father Almighty, please keep us safe in the Sacred Heart of Jesus, I ask You this through the merits of His Passion, Agony and Death. Lord God, bless your creation, may you be glorified in it. Bless the earth, the sun, the moon, the stars and all the cosmic powers. Bring them to harmony just as You are a God of harmony. Straighten the axis of the earth as required, fill the holes in the ozone layer, control the global warming and give us good weather. Bless all the elements of nature. Bless water, earth, wind and fire, heat and cold; high and low pressure systems, moisture and all the factors that contribute to good weather. We need you Lord. Please reveal Your Presence.